On the left side of the soldier's body was his trusty shield (scutum) This was unusual in design since it was not flat, as was the case with shields used by Celtic tribes, but semi-circular. There are many options for scutum size, shape, and materials. The common shape in the mid-first century seems to have been rectangular, but the curve-sided "Augustan" style is still seen on Trajan's Column. The height ranges from 37" to 42", about from the shoulders to the top of the knee, and the width is 24" to 33". The corners are typically rounded, but square corners are easier for a leather rim or a rimless shield. Anyway, if one looks at these accompanying photos, you can see the scutum DID wrap around and WAS rectangular... did it have radiased corners? You decide. 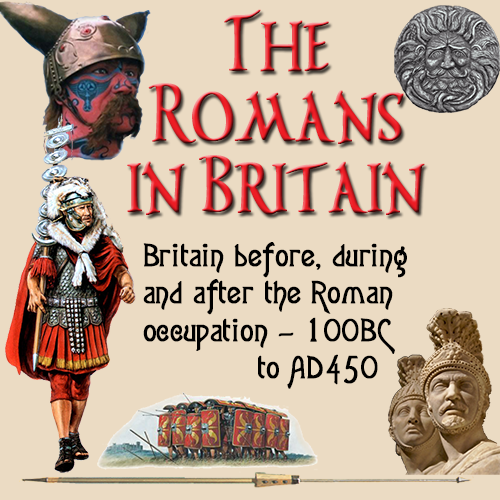 To make the scutum light enough to carry when marching, it was built mainly from flat strips of wood that were laid at right angles to each other. Much in the same way that plywood is made today. The scutum was sealed together then heated and placed in a press while still hot. This press would give the distincive rounded shape. 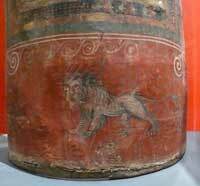 It was then allowed to cool naturally, then when it was removed from the press the scutum would retain it's shape. Construction detail of a scutum, courtesy of Mike Bishop. It was shaped was designed in this way so that any missiles thrown at the soldier would be deflected to one side. This would mean less effort by the soldier would be needed to defend himself. 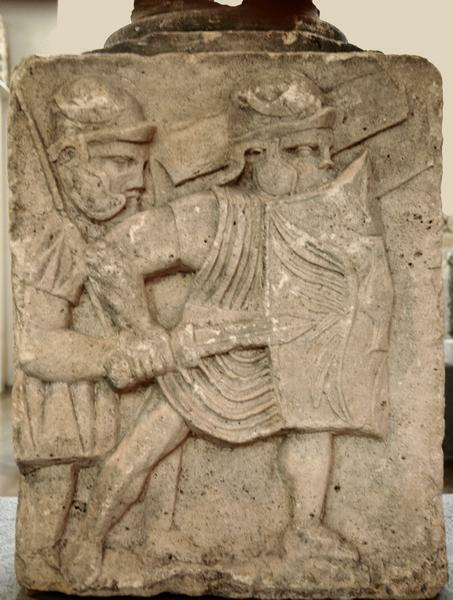 If the scutum was flat, a rock hitting the scutum would make a direct impact, which meant the soldier's arms would have to absord the power generated by the missile. Being curved, the scutum would send the missile off to one side, so there would be less effort needed to deflect the energy transmitted to the soldier's body. 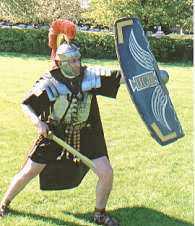 The scutum was not only a defensive tool, it was a weapon in it's own right. The central rasied portion in the middle (umbo) was forged from one piece iron or bronze and was not only used as protectiion for the left hand, but also as a weapon. The raised boss would be thrust into the enemy's face or chest, causing severe inhury and disabling them. Then the sword (gladius) was thrust forward into the opponent's body. 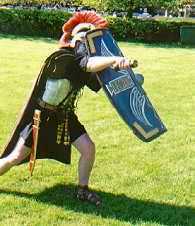 Reenactment of an early imperial legionary shield array. 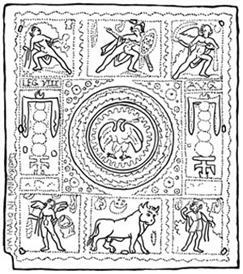 According to Polybius the scutum gave Roman soldiers an edge over their Carthaginian enemies during the Punic Wars: "Their arms also give the men both protection and confidence owing to the size of the shield." with one eye gone, his thigh and shoulder wounded, and his shield bored through [with arrows] in a hundred and twenty places, [he] continued to guard the gate of a fortress put in his charge... [he] boarded the ship and drove the enemy before him with the boss of his shield. For a long time there was pushing of shield against shield and thrusting with the sword, as they were at first cautiously looking for a chance to wound others without being wounded themselves. 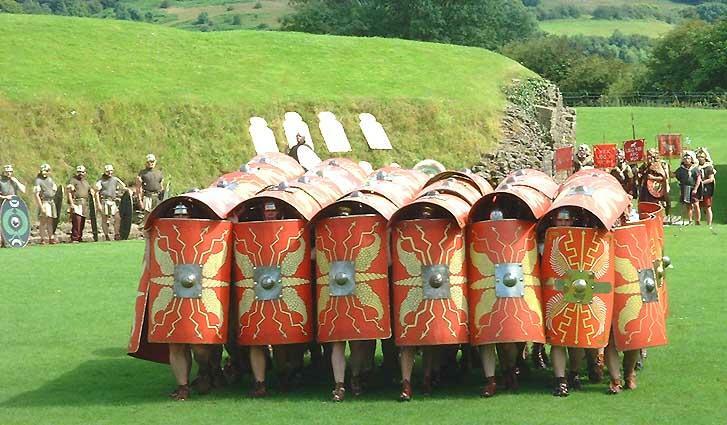 The shape of the scutum allowed packed formations of legionaries to overlap their shields to provide an effective barrier against missiles. The most novel (and specialized, for it afforded negligible protection against other attacks) use was the testudo (Latin for "tortoise"), which added legionnaires holding shields from above to protect against descending missiles (such as arrows or objects thrown by defenders on walls). 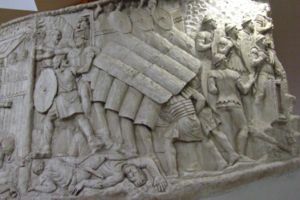 The testudo performed during a siege, as shown on Trajan's Column. 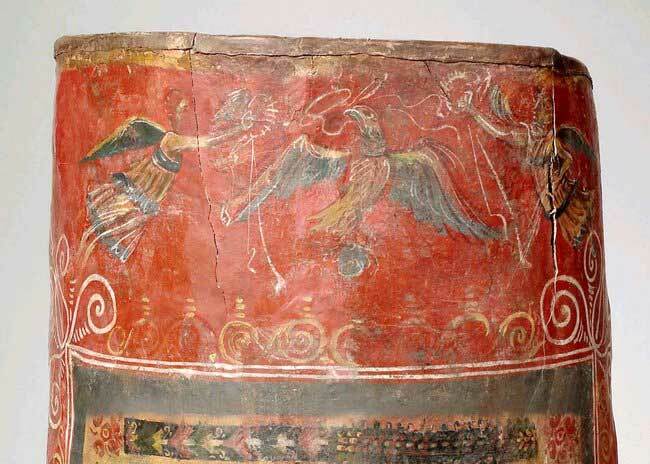 Note the faint eagle-wing and thunderbolt motifs on the scuta. 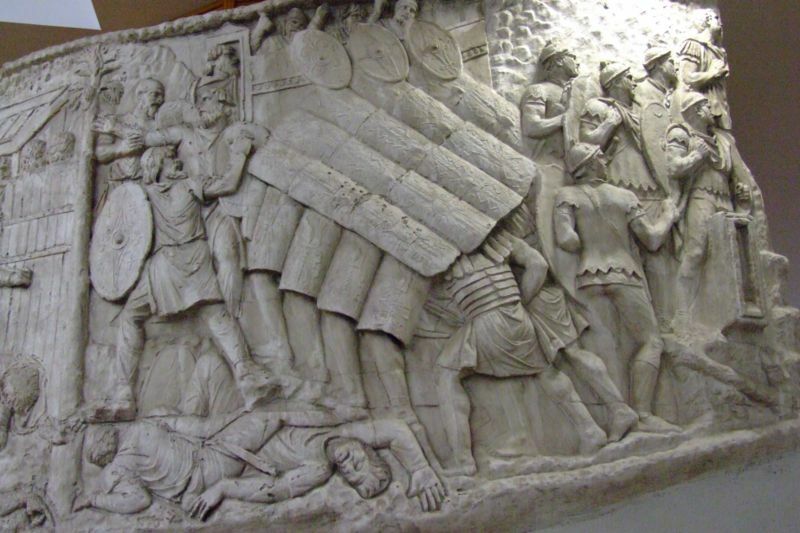 The testudo performed at a show in the U.K., as used during a siege, just as seen on Trajan's Column. Note the wing and thunderbolt motifs on the scuta. One day, when they fell into an ambush and were being struck by dense showers of arrows, [the legionaries] suddenly formed the testudo by joining their shields, and rested their left knees on the ground. The barbarians... threw aside their bows, leaped from their horses, and drawing their daggers, came up close to put an end to them. At this the Romans sprang to their feet, extended their battle-line... and confronting the foe face to face, fell upon them... and cut down great numbers. 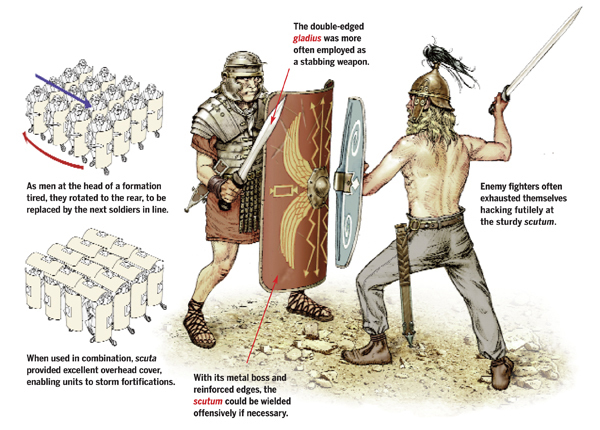 For if [the legionaries] decided to lock shields for the purpose of avoiding the arrows by the closeness of their array, the [knights] were upon them with a rush, striking down some, and at least scattering the others; and if they extended their ranks to avoid this, they would be struck with the arrows. Now Pompey was anxious to lead Oroeses into conflict before he should find out the number of the Romans, for fear that when he learned it he might retreat... he kept the rest behind... in a kneeling position and covered with their shields, causing them to remain motionless, so that Oroeses should not ascertain their presence until he came to close quarters. Accordingly some of the gates were opened by [legionaries], and as soon as a few others had entered, all, both inside and outside, at a given signal, raised a shout and struck their spears upon their shields, and the trumpeters blew a blast, with the result that utter panic overwhelmed the Syracusans. In 27 BC the emperor Augustus was awarded a golden shield by the Senate for his part in ending the civil war and 'restoring' the Republic, according to the Res Gestae Divi Augusti. 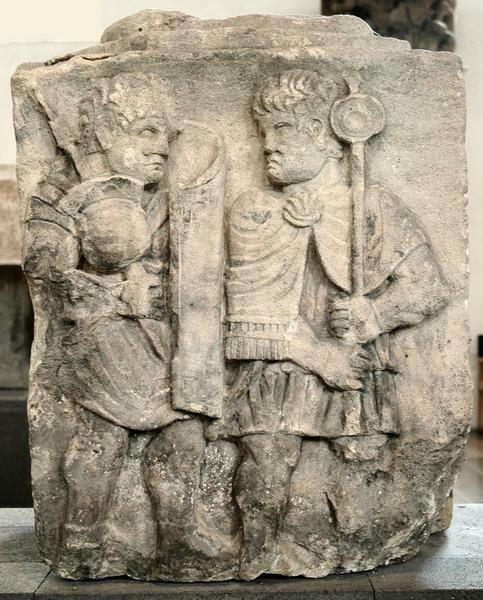 The shield, the Res Gestae says, was hung outside the Curia Julia, serving as a symbol of the Princeps' "valour, clemency, justice and piety". Lest the soldiers in the confusion of battle should be separated from their comrades, every cohort had its shields painted in a manner peculiar to itself. The name of each soldier was also written on his shield, together with the number of the cohort and century to which he belonged. However since Vegetius was not a military man and his works (for example De Re Militari) freely, anachronistically mixed the present with the dim and distant past, we must take his descriptions with a grain of salt. Shields in Vegetius' day were used to distinguish between units, but, contrary to his claim here, there is little evidence that this was true of the earlier empire. Above, is a photo of one of the very few umbos of this type. A detailed, nicely-done highly decorated model. (Photo courtesy of the British Museum). Drawing to the right is same umbo as above... maybe a little clearer in some respects... Was this a common thing? We don't know. There haven't been that many umbos found. A 3-D rendering of a scutum from Legio IX Hispana. Art by and courtesy of Randall Chapmann. 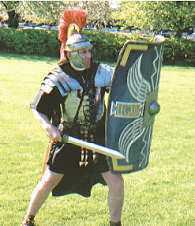 The standard scutum most people associate with the Roman Legions of the 1st Century was semi-cylindrical in shape, large enough to reach from the shoulder to the knees and protected half of the body. It was light enough to be carried on a long march and in heavy battle. Imperial scuta (pl. of scutum) was made of layers of thing wood glued together (just like modern plywood). Each layer was glued at an angle to the previous one for strength. The edge was bound with light sheet bronze or leather and the central boss (umbo) was heavy bronxe or iron. As no intact shields from this time period have been found thus so far, we can only assume that the shield a hand grip and an inner strap enabled the soldier to hold the shield close to his body and also leave his other arm free for other weapons. Most research seem to point to a horizontal grip, this being inferred by an intact scutum from Dura Europas, but it was 3rd Century. 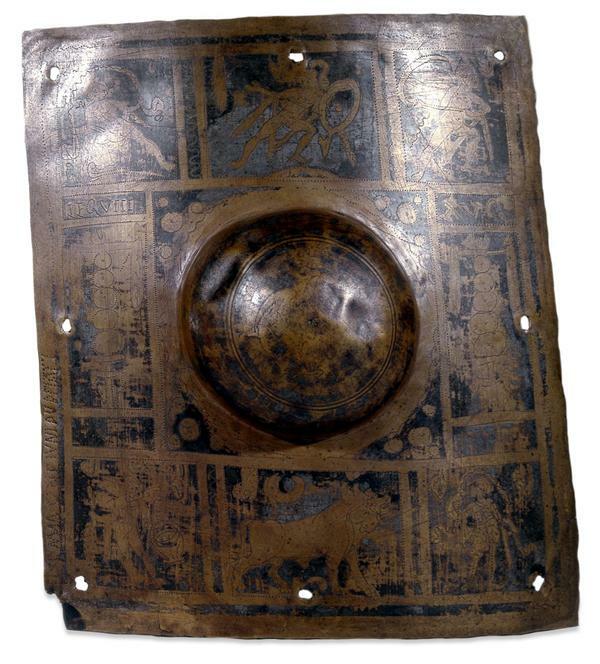 Found flattened and in thirteen pieces, this shield was reconstructed by the excavation team. 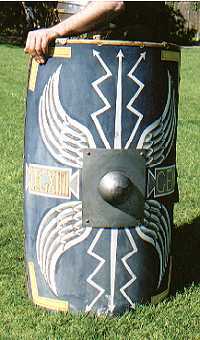 Although much of the resulting object is modern, it remains an important example of the classic semi-cylindrical shield known as a scutum, used by Roman legionaries and known from literary sources; no other examples outside Dura-Europos have been found. The painted decoration reflects Roman victory iconography, including an eagle with a laurel wreath, winged victories bearing additional wreaths, and a lion. When discovered the shield was missing its central boss (umbo). All the armor found within Tower 19, located midway along the western wall, seems to have been awaiting repair when the site was destroyed. Click thumbnails below for larger view. They would wait for the enemy to come close, then as one they would take a step forward and thrust their scuta into the bodies of faces of the enemy, causing them to lose balance and so randier them vulnerable. 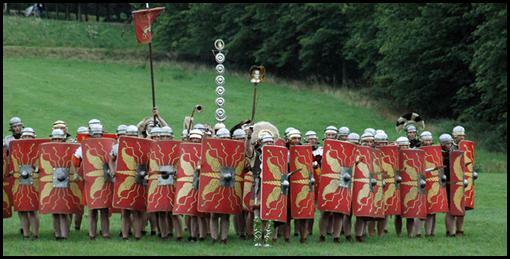 The legionaries would advance in a line towards the enemy thrusting scutum, then gladius. It was this action: scutum, gladius, scutum, gladius... that would disorientate the enemy and take their front warriors out of the battle.